This Dual Zone Hot Sprue Bushing has been carefully designed for applications that demand a higher degree of temperature uniformity. 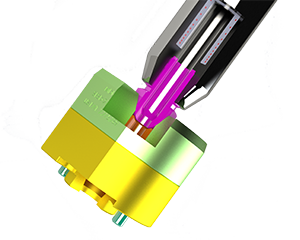 MDi’s internally heated Power Point® Nozzles prevent leakage while providing a uniform heat profile. MDi’s Dual Stage Filter Device avoids clogging and damage caused by the accidental introduction of metal into the injection molding machine. Our Anti-Drool Sprue Bar Device stops material drool with our patented machine nozzle tip. 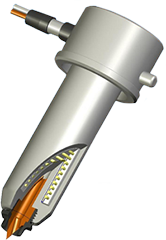 MDi systems are built to customer’s specifications. They are maintenanace friendly and built to prevent system-wide leakage. MDi valve gate systems, multi-gate and single-cavity, are built maintenance-friendly with our advanced “any valve pin in any location” feature. 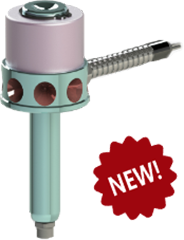 MDi’s patented Anti-Drool Sprue Bar device will eliminate drooling and costly material cleanup. It is compact and easy to install. During injection the melt is filtered and homogenized in two stages. Decompression occurs with virtually “zero” pressure drop. 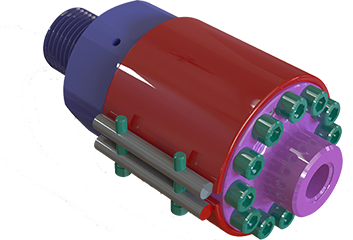 MDi’s internally heated Power Point® nozzles are machined from a single piece of H-13 steel, eliminating the stresses and leakage that can occur with multiple-piece nozzle body constructions. a need to reduce cycle time, reduce scrap rates, and increase overall productivity and costs to manufacture, as compared to a “cold runner” system. At MDI we recognize the importance of hot runners and we offer high quality, high performance systems that are durable, dependable, competitively priced and feature MDi’s innovative nozzle and manifold technology. Hot Runner Systems – Hot Halves Made In U.S.A.
MDi is a world-leading American manufacturer of Hot Runner Systems and components with the capability to develop custom and innovative solutions for plastics Injection Molding. Established in 1984, MDi continues to offer experience in the design and manufacturing of complete, internally heated and balanced precision Hot Runner Systems, Valve Gate Systems, Sprue Bushings, Molding Machine Nozzles, Filter Nozzles, and MDi’s unique system components and controls. All of our components are in-house designed and manufactured at our facility in St. Charles, IL, with a focus on quality and reliability.